The iconic Wiggles have been entertaining children all over the world for 28 years. Emma, Lachy, Simon and Anthony have cemented themselves as phenomenal entertainers staying true to the brands early childhood learning principles. These extraordinary performers are continuing the brands legacy, as well as finding new ways to entertain & engage young children. Children who once saw The Wiggles, are now bringing their children to see The Wiggles. This second generational affect has meant that the age profile of Wiggly audiences is evolving. As well as preschool children (2-5 years), babies and toddlers (0-2 years) are also being introduced to The Wiggles ‘edutainment’. As the New York Times said, “They are the band that rocks the cradle”. Following the success of The Little Wiggles segment within The Wiggles, Wiggle, Wiggle, Wiggle TV Series, a whole new world of Wiggly fun has been opened. The Little Wiggles brand alongside new character art – including Little Emma, Little Lachy, Little Simon and Little Anthony, has provided an enormous opportunity for incremental growth for our license partners in baby/nursery toys, clothing & accessories. “Even after 28 years, The Wiggles brand continues to evolve! Babies and toddlers have always been a part of our audience so it’s great we are finally catering specifically for our tiniest fans with these products” says Paul Field, Managing Director, The Wiggles. 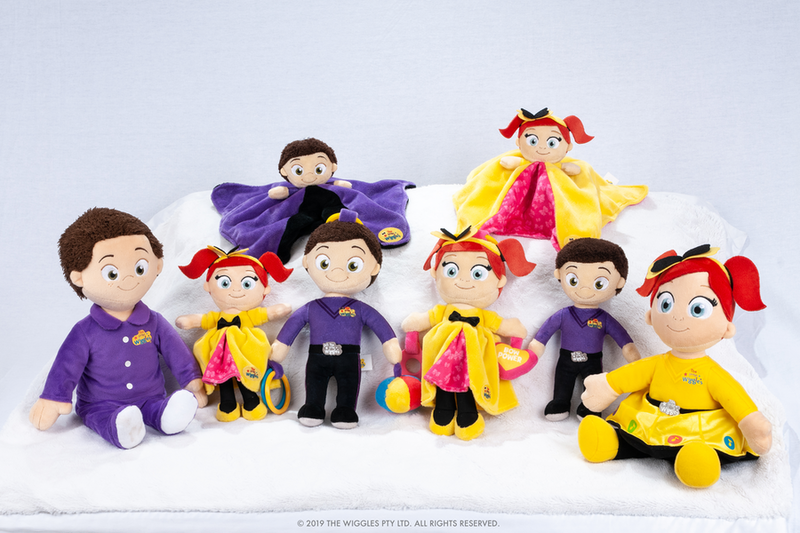 Today, The Wiggles licensee, Jasnor (Australia) Pty Ltd, are launching a range of nursery items under “The Little Wiggles” brand, specifically catering for the ‘edutainment’ needs of babies & toddlers (aged 0-2 years). These nursery toys have been developed on early childhood development frameworks and are also constructed in super soft fabrics to cater for sensitive skin. Available at Big W from the 31st January, the range includes Little Emma and Little Lachy: animated plush, comforters, activity toys, rattles and a Wiggles soft book, soon to be joined by Little Simon and Little Anthony, as well as a range of baby clothing & accessories. It’s a whole new baby world of Wiggly fun!